We offer wide range of digital flame photometers with fitted (Na & K) 3½ digit LED display (ppm) along with compressor and other accessories Ca & Li filter can be provided on request. We offer the wide range of Microprocessor Flame Photometer with following Compressor Unit. 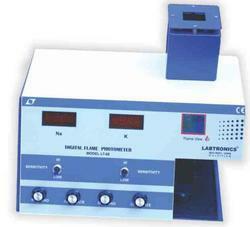 Digital Flame Photometers offered are used in clinical laboratories or in soil testing labs. We are a reckoned enterprise, which is engaged in delivering Photometer to the clients. The offered range is made utilizing optimum grade raw material and innovative technology in strict conformation with the international quality norms and standards. Along with this, the offered range is suitably checked on different characteristics to maintain its authenticity throughout the designing process. With fitted (Na & K) 3½ digit LED display (ppm) along with compressor and other accessories Ca & Li filter can be provided on request. Dual channel single aspiration with filter (Na & k) for medical use. Final result in meq/L 2½ digit dual LED display for simultaneous results along with compressor & accessories . With Sodium (Na) and Potassium (K) filters, upto 5 points calibration, direct readout in pp, & meq/l, auto filter selection, auto ignition, 24 x 4 line LCD display, Single Aspiration, RS232 interface, printer attachments facility, with compressor and other accessories for lab & medical use. Ca & Li Fileres and optional at extra cost.